The image resizer and optimizer Riot (Radical Image Optimization Tool) can process and optimize images that are loaded into its interface. The program is offered as a portable version and installer at the developer's website, and is one of the most powerful but also easiest to use programs of its kind. Single images that are loaded into the interface are displayed in their original form and optimized form side by side. The preview copy of the image is immediately updated whenever you make changes to the processing parameters in the Riot interface. As far as supported image types are concerned: Riot supports all common image formats that are used nowadays, as well as Adobe Photoshop PSD files, many popular HDR and RAW formats, and several scientific image types. This view mode can be changed so that only the optimized image is shown in the application's interface. It is an excellent option to check and tweak the quality of the output before you run it on the single image, or on a number of images that you want to optimize. Since you can verify the output quality as well as the size reduction, it is easy as pie to make the right adjustments that take a big chunk of file size out of the image without affecting quality too much. The output size of the preview image is displayed as well in the interface. 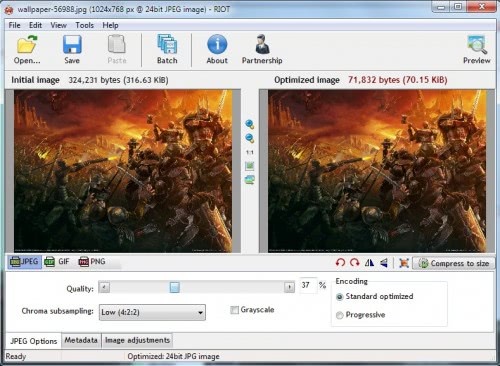 The image resizing and optimization options are accessible in the lower half of the program. Tabs at the bottom are used to display them on the screen. The software can output the images as jpeg, gif or png images, and the first tab reflects that as it offers format specific options. This includes quality and encoding settings that have a direct effect on the size and quality of the optimized image. The other two tabs can be used to remove metadata from images, and to make other adjustments to them before they are saved to the computer. Additional controls are available regardless of the selected image output format. It is for instance possible to zoom in or out of the image, rotate images, resize them or compress the image so that it does not exceed a specified file size. 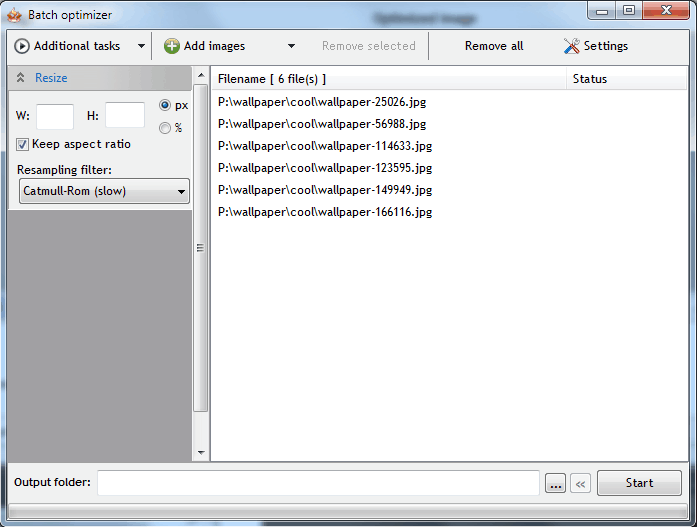 The batch optimizer on the other hand can be used to effectively resize and optimize multiple images. Images can be compressed, resized, rotated or flipped easily with the tool that can overwrite the existing images after processing, or save the edited ones in another folder or under a new name. Riot is compatible with 32-bit and 64-bit editions of the Windows operating system. The image resizer and optimizer is free for personal use and available as a portable version and an installer. It is an ideal program for webmasters who want to optimize the screenshots and images they have published on their website, and also for users who want to use images in PowerPoint presentations, Word or PDF documents to decrease the size of the presentation or document. The main appeal of Riot is the preview feature, which visualizes the changes and displays the improvements in regards to size, and the ease of use of the program as a whole. You forgot that Riot also came bundled like a IrfanView plugin. Note that this nice application is also available as a plug-in for GIMP.